Just in time for tax day. Happy tax day! If you haven't filed yet, run. You've got a few more hours to get your returns to Uncle Sam. For those of us all squared away, here are five things you should know about federal taxes. The IRS Oversight Board reports that 13% of us say it's OK to cheat on our taxes. At least as many actually do. The "tax gap" -- the amount the Internal Revenue Service fails to collect because of tax cheaters -- is $300 billion a year. Eighty percent of that figure is from individuals underreporting their income. Non-filers account for the rest. This is serious money. $300 billion is enough to pay for the Department of Justice, the Department of Energy, and all the interest on the national debt combined. It also works out to about $1,000 per U.S. citizen. The IRS has a lucrative whistleblower program for turning in cheaters, paying tipsters 15%-30% of the amount recouped. The paydays can be huge. An accountant recently blew the whistle on his employer's tax scheme, netting the IRS $20 million in back taxes. Just last week, it sent the tipster a check for $3.24 million (after taxes, of course). Know a cheater? Turn 'em in here. 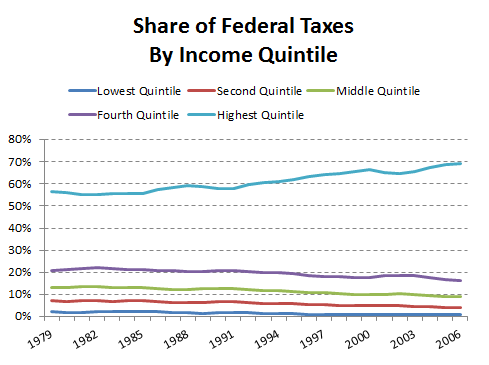 In 1979, the highest income quintile paid 56% of all federal taxes, while the lowest paid 2.1%. In 2006, the highest quintile paid 69% of the tab; the lowest, 0.8%. This causes all kinds of class warfare. It is worth noting, though, that income growth for upper earners has far outstripped that of average and lower-income folks. And even though top earners pay most of the tax burden, their tax rates are often a fraction of those making considerably less. Good example: Warren Buffett noted in 2007 that he paid a 17.7% tax rate on his $46 million income, while rank-and-file underlings at Berkshire Hathaway (NYSE: BRK-B) paid as much as 39.7%. Why? Two reasons. One, payroll taxes (which cover Social Security and Medicare) only apply to the first $106,800 of income. So Buffett making $46 million pays the same dollar amount of payroll taxes as someone making $106,800. Two, most of Buffett's income comes from capital gains and dividends, typically taxed at a maximum 15%. Regular income can be taxed at over twice that rate. Buffett even once made a bet with a roomful of wealthy businessmen. "I'm willing to bet anyone in this room $1 million that [their tax] rates are less than the secretary has to pay." At least that's one interpretation of this chart. Source: Joint Committee on Taxation and author's calculations. "Federal taxes are the lowest in 60 years, which gives you a pretty good idea of why America's long-term debt ratios are a big problem. If the taxes reverted to somewhere near their historical mean, the problem would be solved at a stroke." "Income taxes, in particular, both personal and corporate, are low and falling. That trend is not sustainable." "Employment taxes, by contrast -- the regressive bit of the fiscal structure -- are bearing a large and increasing share of the brunt. Any time that somebody starts complaining about how the poor don't pay income tax, point them to this chart. Income taxes are just one part of the pie, and everybody with a job pays employment taxes." 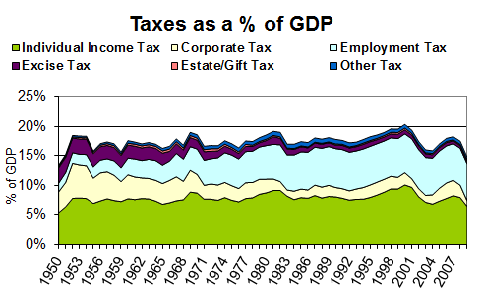 Also, large companies like General Electric (NYSE: GE) often pay a far lower tax bill than the advertised 35% rate -- a point that should become clear when you notice how far corporate taxes as a percentage of GDP have fallen over the past half-century. Some of these deductions are good, well thought-out policies. Others make little sense. At any rate, we shouldn't pretend that so-called spending in the tax code is different from many other forms of government spending, particularly cash subsidies -- a point conservative Harvard economist Greg Mankiw made last year in this essay. In 1935, President Franklin Roosevelt set a special 79% tax rate on those earning more than $5 million a year. For three years straight, only one man in America made that much coin: John D. Rockefeller. Rockefeller wasn't happy with this. "When a man has accumulated a sum of money, accumulated it within the law, the Government has no right to share in its earnings," he once said, according to his biography, Titan.